On the back of a highly successful first season, we're proud to announce a brand new and expanded two year ground-breaking collaboration between THE PROTEIN WORKS™ and EVERTON FOOTBALL CLUB which will see the two parties work together over the 2016/17 seasons. Back in 2013 history was made and sports nutrition within professional football changed forever. This is because for the first time in the history of The Premier League, and in line with our commitment to sports nutrition innovation, Everton Football Club's entire first team squad were supplied with bespoke sports nutrition formulas developed by THE PROTEIN WORKS™. The new agreement sees an expansion of the bespoke formulas developed between TPW™ and Everton. 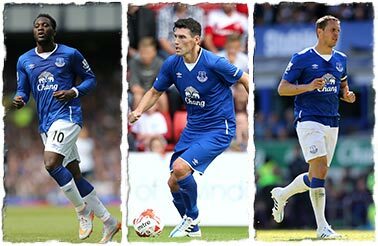 These cutting-edge recovery formulas are personalised to individual player profiles and are the result of months of research and development into pioneering post recovery formulas designed to aid recovery post training and post match to meet the intense and exacting demands of Everton's elite first team squad. Each one incorporates the very latest cutting-edge research, finest quality ingredients and flavours, formulated and manufactured at TPW™ Towers exclusively for the Blues. "Last season it was amazing to pioneer a first in English football. No other team had ever brought that level of sport nutrition customisation and we believe the results spoke for themselves. But this season the squad will have access to unparalleled levels of bespoke sports nutrition, with recovery shakes specifically formulated based on a player's weight. This is another industry first and our collaboration with Everton is truly ground-breaking." Everton are pushing boundaries in terms of player conditioning and performance, ultimately to understand where a competitive edge can be gained. Through working with us here at TPW™, it became clear that the unique demands placed on an elite Premier League footballer week in week out required a revolutionary and bespoke approach to supplementation. With an emphasis on speed, power and endurance, every single component of fitness is tested to the limit during training sessions. The result is an emphasis on fast recovery in order to build on fitness levels day after day. A post training recovery formula was required to do just that, enhancing recovery, supporting the immune system and replenishing the body's energy systems to ensure each player can sustain a high level of conditioning, prevent over-training and continue to improve session after session. The next challenge for us at TPW™ was to assess needs of the players immediately following match day. This is because during a 90 minute game players are literally required to work flat-out to the point of exhaustion. As a result, oxygen usage sky rockets resulting in lactic acid accumulation in the muscles, which in turn causes your body to pull alkaline reserves from bones. Furthermore, ATP stores are diminished, glycogen levels are depleted and the immune system becomes suppressed. All in all, the body has a lot to cope with which is why the players required a post match recovery formula that served to combat all of these, enhance recovery and ultimately ensure they are physically ready for the following fixture. Throughout 2014, Everton and The Protein Works™ have been monitoring player performance and recovery rates. Out of this research came a commitment to develop a next generation range of bespoke recovery formulas for the 2014/15 season. These brand new formulas provide the most detailed and ground-breaking formulations ever seen in elite professional football with an individual player's profile, such as weight, being considered in the final formula. Working to a tight deadline, the project involved a high level of complexity and speed to not only develop a range of formulas, but also to manufacture and supply to Everton in time for pre-season training. As with all TPW™ products, we use only premium grade ingredients and proven research. The purity of the supplements we formulate and produce in-house, combined with our innovative approach to customisation offered Everton something unique and ground-breaking. Head of R&D at TPW™ Nick Smith explains more about the collaboration, "The whole process has been very complex and technically demanding, but credit must be given to Everton's conditioning team who have demanded excellence. The Club's motto Nil Satis Nisi Optimum, which means nothing but the best is good enough, was definitely at the forefront of all our minds on this ground-breaking project. To help pioneer a 'first' in English football has been amazing." As well as having to deliver in terms of performance, each recovery formula was required by Everton in a convenient format for the players to consume post training and post match. Not only that, the products had to have exceptional taste and to be easily consumed anywhere anytime after a strenuous training session or match. To meet all these objectives, we developed our brand new i-SHAKE™ single shot recovery system, and infused each formula with our innovative flavours. The players were key to the overall development so we incorporated taste testing sessions into the overall R&D programme. This collaborative approach has meant there has been zero compromise throughout the project and the Everton players can actually look forward to their recovery shake, as well as benefiting from their exceptional nutritional value. As you would come to expect at this level of elite performance, all products were also batch tested for WADA banned substances by an independent laboratory. This ultimate level of testing gives complete peace of mind to Everton players and coaching team that each and every recovery formula is 100% natural and safe. The result of all this intensive development is another Premier League first! A range of innovative recovery formulas designed specifically for Everton Football Club first team squad. These formulas are not available anywhere else and are totally exclusive to the Blues. 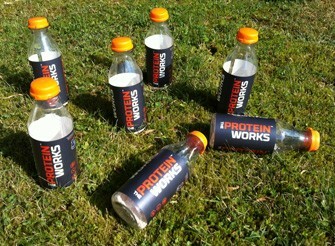 They include the TPW™ Post Training Recovery Formula and the TPW™ Post Match Recovery Formula, amongst others. The TPW™ i-SHAKE™ with its rapid repair and recovery system has been designed to cater for the player's needs during the key nutrient window post training. Immediately following training there's a huge emphasis placed on recovery, but equally it's about providing the players' with everything their bodies need to repair to ensure they can be loaded above their habitual level once again during training the next day. Essentially it's about recovery whilst at the same time supplementing a progressive training protocol. This is why every customised formula the player's receive contains TPW™'s unique premium grade whey protein, made solely with all naturals colours and premium flavours, combined with a brand new multi-source carbohydrate blend, latest digestive technology and a number of active ingredients proven to aid muscle growth and repair. 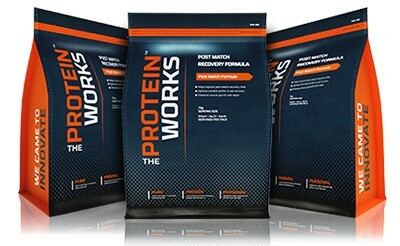 The TPW™ Post Match Recovery Formula has been comprehensively designed to provide the player's body with everything it needs during the critical nutrient window that follows a 90 minute match. Sports science journals are all in agreement that the nutritional requirements of players following a match are very different to those following training. With less of an emphasis on supplementing a progressive training protocol, each shake needs to enhance the entire recovery process and prevent physical exhaustion. Once again we developed a formula using TPW™ premium grade whey protein combined with a specially designed multi-source carbohydrate blend to ensure all the players macronutrient needs are met post workout. In addition to this, the amino acid profile of each formula has been scientifically engineered to optimise the entire recovery process and digestive enzyme technology has been applied to further improve the absorption of the active ingredients. For further information please read the Official Press Release.